An excerpt from the May 1855 GODEY'S LADY'S BOOK expresses the Victorian's love of hair: "Hair is at once the most delicate and lasting of our materials, and survives us, like love. It is so light, so gentle, so escaping from the idea of death, that with a lock of hair belonging to a child or friend, we may almost look up to heaven and compare notes with the angelic nature - may almost say, 'I have a piece of thee here, not unworthy of thy being now.'" BROOCH c. 1840 - 50. 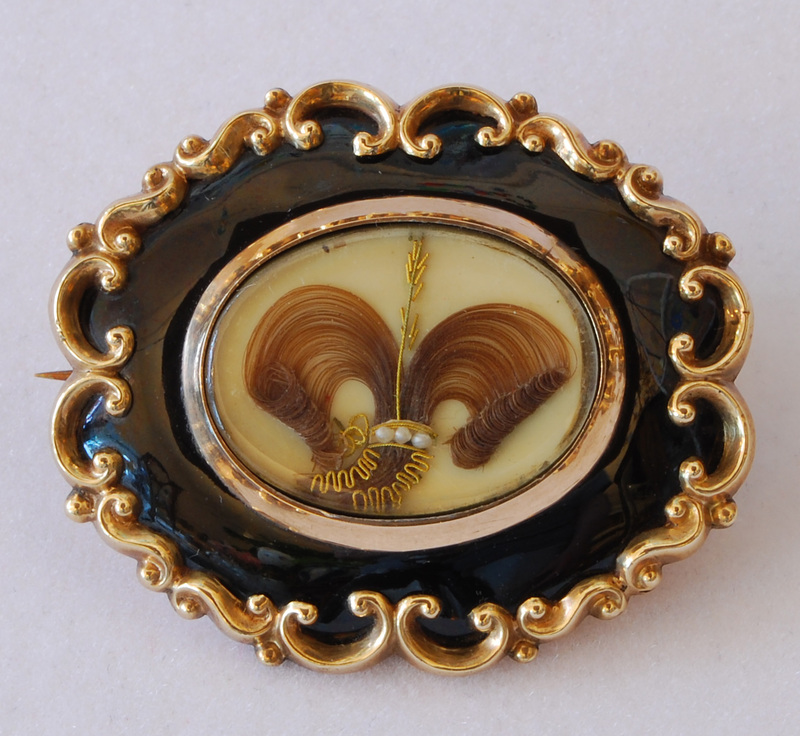 GOLD WITH BLACK ENAMEL AND "PRINCE OF WALES" TABLE WORKED HAIR DESIGN UNDER ROCK CRYSTAL. A MEMORIAL PIECE. 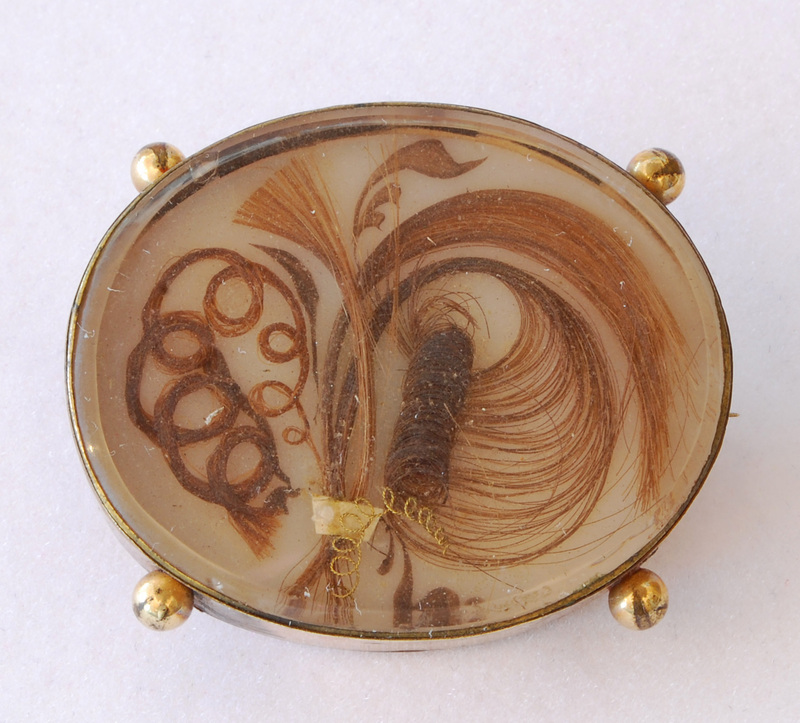 BROOCH c. 1840 - 50. PINCHBECK WITH TABLE WORKED HAIR DESIGN UNDER BEVELED GLASS. BRACELET c. 1850 - 60. GILT FITTINGS WITH WOVEN HAIRWORK AND HAIR IN FLAT WEAVE UNDER BEVELED GLASS. 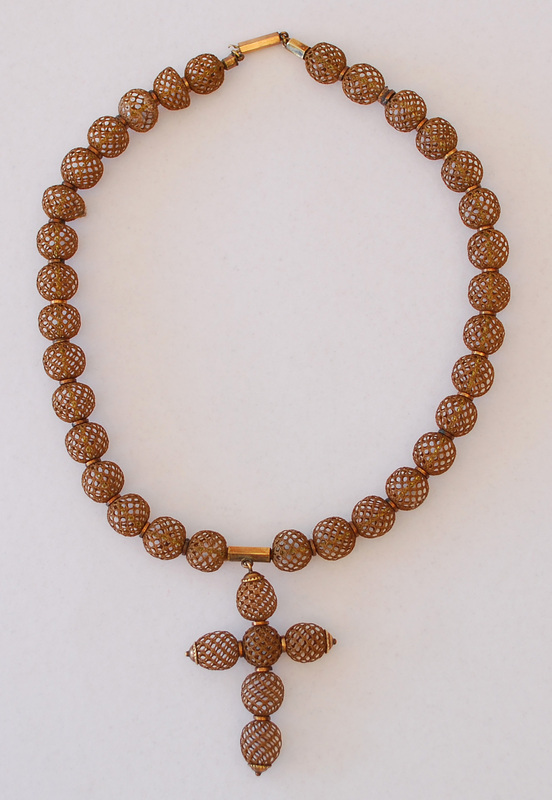 NECKLACE c. 1850 - 60. 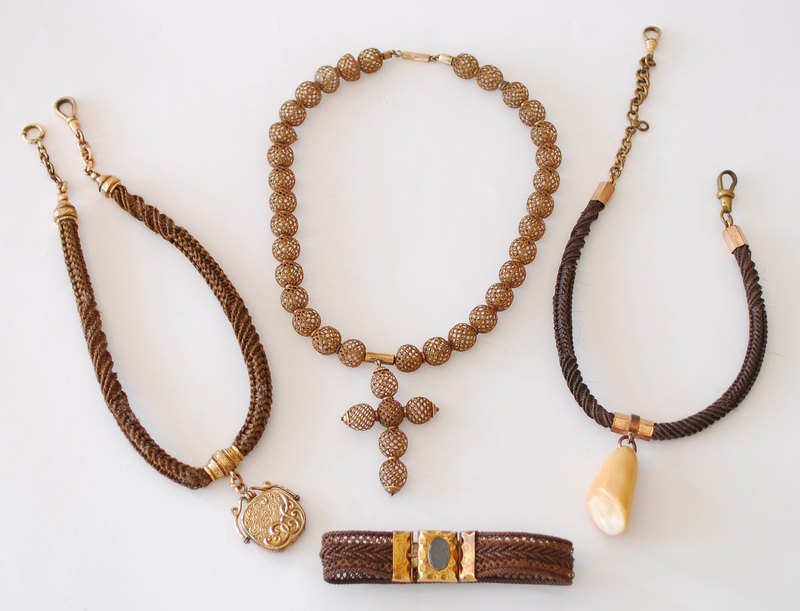 OPEN WEAVE HAIR BEADS AND CROSS. 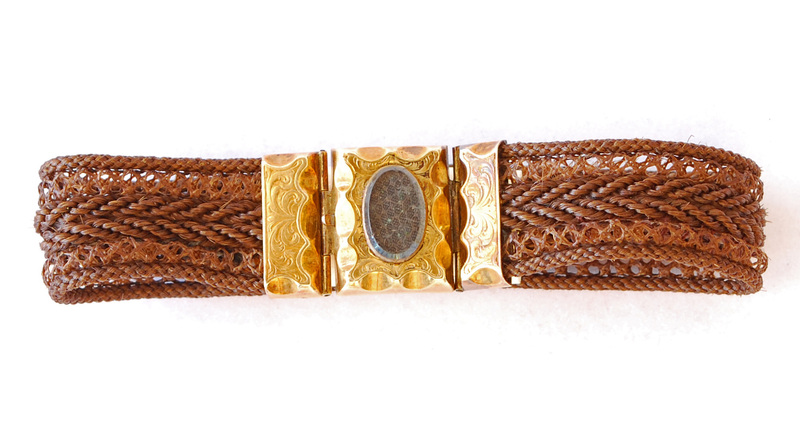 WATCH CHAIN c. 1860 - 70. 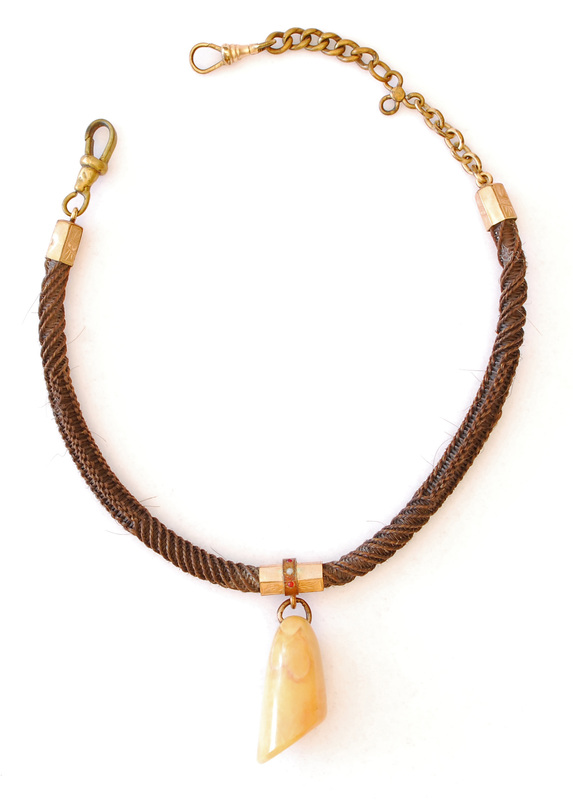 WOVEN HAIR - WORK CHAIN WITH GILT FITTINGS AND ELK'S TOOTH FOB.